October 5, 2016 51 Comments This post may contain affiliate links. I’m going to be totally honest with y’all today. Well, I always am but today might not be the pretty kind of honest. 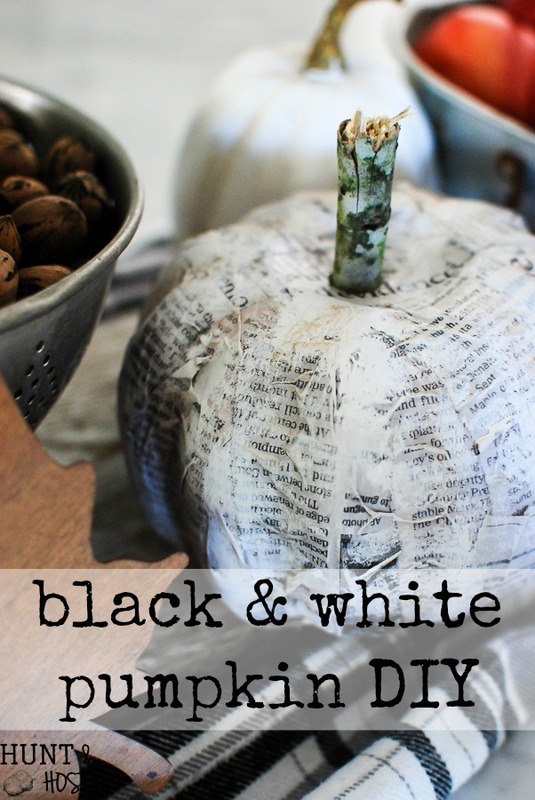 I’m sharing how to make these adorable black and white pumpkins that go with the whole books and pages theme I have going on at my house for fall. They are messy to make, but that isn’t the ugly part of this post. 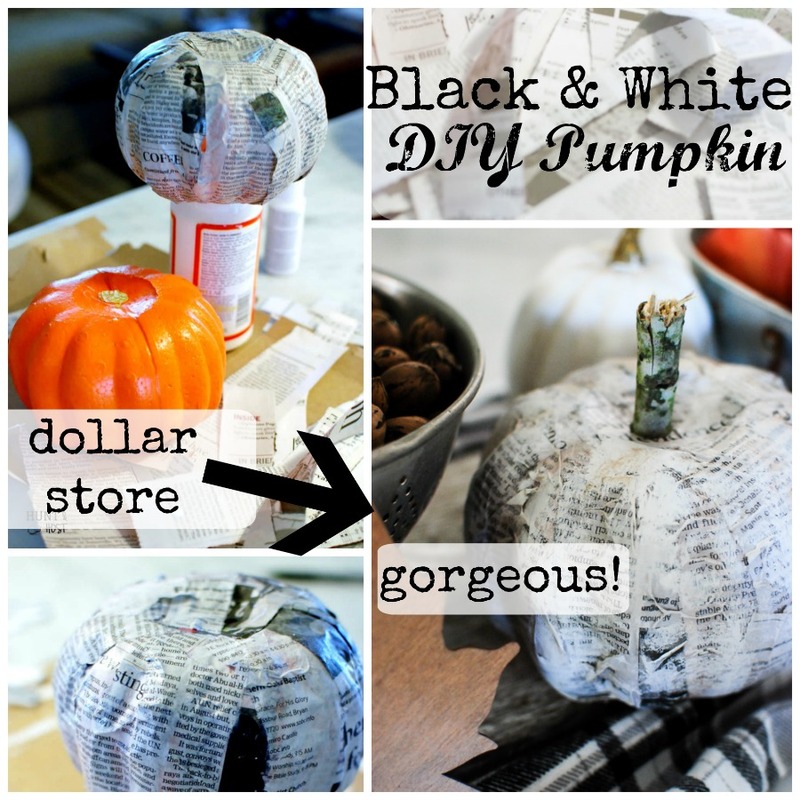 The truth is I am struggling sharing this silly little DIY with you. I have been in a funk. My main thoughts have been what does it matter? What does it matter that my house is all cute and cozy for fall? Who cares if I can make a precious pumpkin for a dollar? Wouldn’t life just be easier if I didn’t share all this stuff on a blog? What difference does this little space even make? I’d like to tell you I have a good answer to these questions circling around my head like flies. But I don’t. I don’t have scripture to throw out that will miraculously make me feel better. My questions are deeper than they sound and they seem never ending. The headlines are laden with teachers having inappropriate relationships with students, stealing innocence, war and refugees, murder, shootings and don’t even get me started on the presidential election at hand. All the heaviness weighs on me. Normally I would tell you that God is in control and he wins in the end…and he does, that hasn’t changed and it won’t. But today I just feel a little lonely and sad. I see our world getting busier and busier, having less time for people, less time for real relationships. More time for screens and self. This feeling isn’t totally new to me, I think it’s part of why I’ve always been drawn to old stuff. Tangible pieces of the past when neighbors raised each others kids, community was strong and the streets at least felt a little safer. My life is full and blessed beyond measure, but I can’t help feeling the way I do. I suspect there are many others like me out there, maybe reading this right now. Others that want to make a difference. Others that want to know they are not alone. Do you feel scared to step forward, do you feel tired of putting yourself out there to only get hurt, do you feel like nobody would miss the little things you do if you didn’t do them anymore? I love this space, I know God called me to it and I don’t think he has called me out of it yet. I just don’t want to be another distraction behind a screen. Another person who’s life seems picture perfect, there is already enough of that to go around. I need this space as a source of accountability, a place to get the ideas out of my head and share my thoughts. Not because they are anything educated or praiseworthy but because I simply won’t process thoughts and scripture and truths without an outlet and timeline to go by. Plus I feel called to share the gospel. For one of the first times in my life I feel like I am working so hard towards a goal, but I don’t know what that goal is. I always have a goal. But today, I don’t have eyes locked on a path. I have no idea what the future holds or what I even want it to hold. That’s a brand new place for me. While we never are really in control I have always felt a sense of direction. I suspect this is right where God wants me. To just move one day at a time and let him do the rest. So I am doing my best to put one foot in front of the other and have faith there is solid ground waiting under each step. I trust the Lord. There are no mistakes in the gifts and desires God placed deep inside you and me friend. He uses it all for good, even silly pumpkin DIY’s. Sometimes that is a hard truth to remember and recognize. Like I said, it’s a current struggle for me. Maybe God forced (seriously, I did not want to hit send) me to share this with you today to encourage you, I hope so. It would certainly bring purpose to these pumpkins! I know it encouraged me to share. I hope you will leave this space and know God sees you and wants you to walk one day at a time, trusting him to use you and your struggles for his good. We all walk through season when the devil’s words suffocate us and the only way to pass through the valley is to focus on truth. I’m here with you, reminding us both to stay focused. This little pumpkin was really fun to make. I asked my kids if they wanted to help and only my six year old took me up on the offer. I loved doing this project with him. And it goes to show you, I always like simple projects – if my six year old can do it so can you! I got my pumpkins from the dollar store and removed the ugly stem, they are Styrofoam so it was easy to snap off. 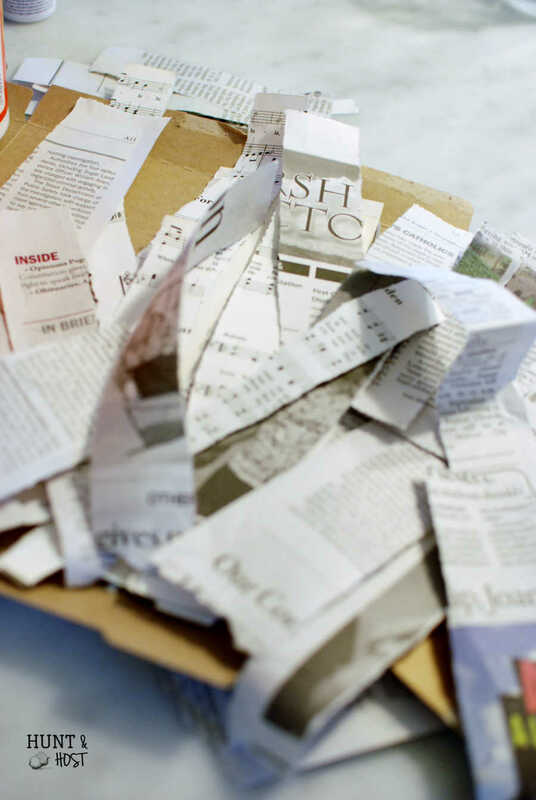 Rip up your newspaper into strips, about one inch wide. Here is where it gets messy, we used our hands, but you could use a sponge brush. This is also why my son thought this project rocked. 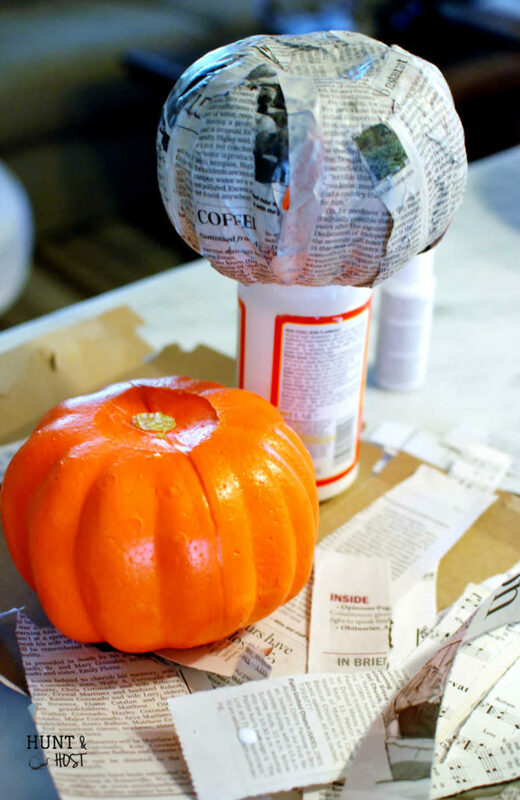 Pour some Mod Podge in a cup and smear it on the pumpkin. 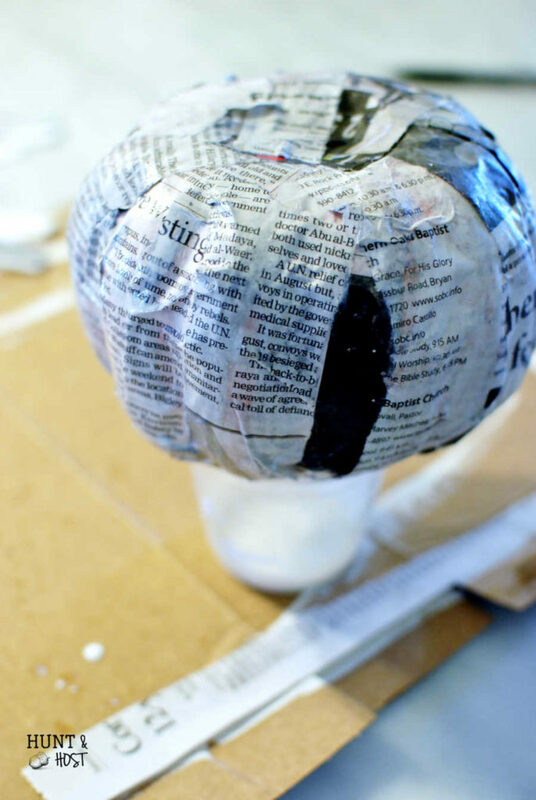 Next, piece by piece add the newspaper strips, rubbing more Mod Podge on top as you go. It’s a sticky gooey mess, just like life! It’s ok if there are wrinkles and small parts not covered. Some of the headlines from our paper were less than appealing, but I slathered them on too. We will take care of those next. Let your gooey pumpkin dry. Next dry brush (by this I mean don’t completely saturate your brush in paint, just use a little bit of paint and lightly brush it on) some white paint on the headlines you don’t like and on the “high” parts of the pumpkin. 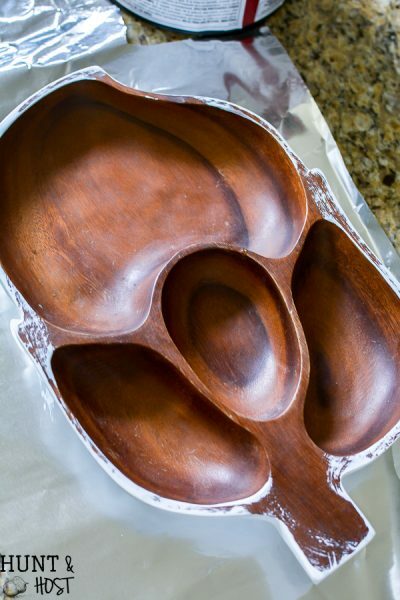 Use your dark wax or brown paint and lightly graze over the “low” spots, like the creases and around the stem area. This gives your pumpkin depth and life! 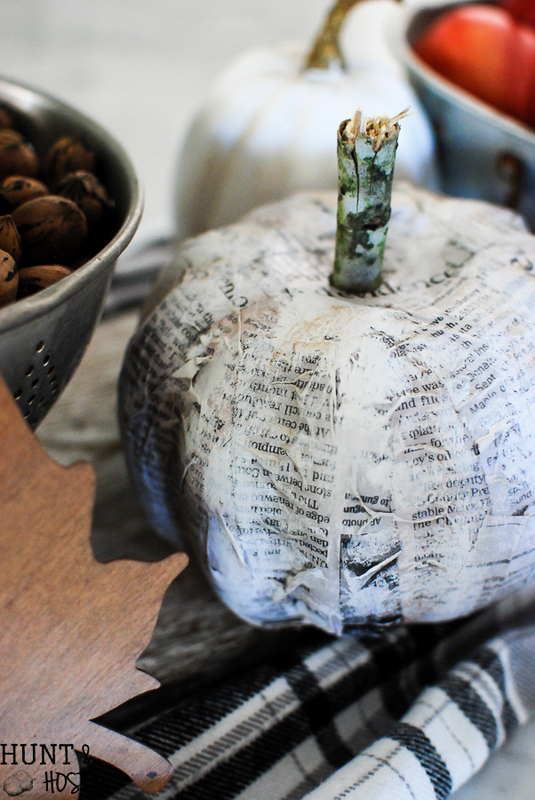 Now poke the stick into the top of your pumpkin, leave it tattered and torn. 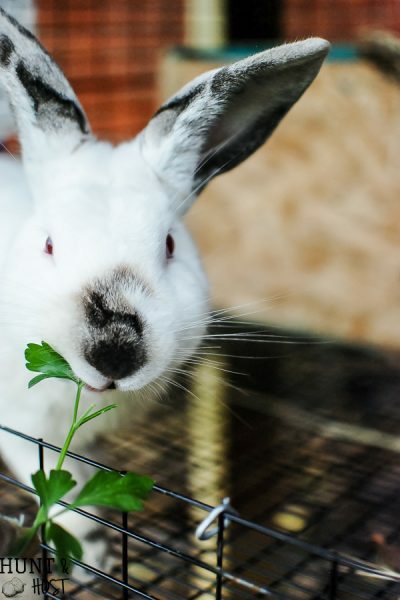 You have the cutest black and white pumpkin ever! I’ve said before that Hunt & Host is a place to get your hands dirty and your hearts clean. Friends, thank you for letting me live that out today. So sorry you have been having a little struggle! Every time I think about whether my words or my post matter I think of my kids. I know that one day when I’m no longer here my kids and my grandkids will be able to feel like they really “know” me even if my physical self is a distant memory. I love being able to write something that inspires others too..don’t get me wrong but this is what keeps me posting. 🙂 You have a gift friend…and you are making a difference in this crazy world we live in. This is a great perspective and one I need to think about more often. I love the fact that they will see all my crazy some day!!! So glad you keep posting and carrying on, you are so good at what you do! thank you friend! my first thought for you was “cheer up Charlie”. but I know from experience thats much easier said than done. so only thing left to do is let Christ be your goal and keep your eyes on Him! He will not fail you…………….or me! Thank you for this post, I needed to read this today…. Sweet friend, I am so glad to be even a sliver of joy in your world…thank you for this. I am so glad you are ding better, what a devastating loss. God is so good. He does love us right where we are, so thankful for that! Hugs. I have been in that lonely, quicksand valley myself (7 years of undiagnosed depression). Truth and trust are the best path out. If the world around us wounds our spirit so, how much more Our Father’s heart. Thank you for reminding ME that my gifts aren’t a mistake. I love the encouragement and insight that you wrap around a project. Maybe you’re sowing, or maybe you’re watering, but God gives the increase if we just offer what we have. Remember He is carrying you right now. I can tell you I have been where your are, but I also know it grieves God to know that his most precious child, believes she have no purpose. You have no idea the people you touch with your ministry through this blog. Remember who you serve and why, and I have learned in a recent bible study, “Being thankful brings you peace” Thank God for all that you do have right at this moment, what he has done for you in the past, and the promises he gives you for tomorrow. You never walk alone, he is in the valley as well as on the mountain-top, rest knowing who is carrying you right now…. SO true, he has me and he has you. Thankfulness is always the best place to start. I appreciate that reminder. I will start today with great thanks for all of you and your kind words. I know God is speaking to me through you all! I totally went through the heaviness a week or so ago. First of all, I turned off the news & tv. I needed a little detox. This is not to say as Christ followers that we should stick our head in the sand, but sometimes when we absorb so much of the world we need to just focus on truths and concentrate on our abundance. God is in Control. You are spreading his love through your blog. He loves YOU. The world is a crazy place right now and that is in the scripture. Do not be disheartened for I have overcome the world!! Yes – God wins, I will rest in that. I agree we have to remove ourselves from the things that bring us down occasionally to refresh. I think talking about it helps me too. You all are so sweet to listen. I really meant the post to be an encouragement for anyone feeling the same that they were not alone. I wasn’t looking for all the love in return, but I am so thankful for everyone. Y’all are amazing!!! thank you dear friend, I know you can relate. I agree this time of year always seems to close in on me. It’s nice to know I am not alone, but hate that we go through doubt at all! ear that their life doesn’t make a difference, questioning why hasn’t God answered my prayers, etc., etc., etc. I think your blog is a ministry to others and that’s why you are being attacked with discouragement. Please don’t believe those lies. I love that you put this in writing. I am feeling the same right now, and this is inspiring to me to also keep putting one foot in front of the other and have faith…. just keep swimming, just keep swimming…I keep hearing that silly jingle in my head! Friend, it’s like you were sitting across the table from me having a conversation. I have been feeling the exact.same.way! I struggle with thinking that my little space doesn’t matter but I know I want to make a difference and hope that something I share will. I just finished reading Uninvited and this quote really stuck with me – “Today’s disappointment is making room for tomorrow’s appointment.” There is something great in store for you – I just know it! Hang in there! Let’s do lunch soon! Kim, hugs with quiet prayers your way. Blessings and smiles, Emilou???? You, my blog friend, have been on my mind since I read your blog earlier today. I love the way God gives you a message to weave through your blog while sharing your passion for Him and of crafting. Your ‘small thing’ does that for all of us that follow you. It’s actually a huge thing to some of us. Thank you for sharing this. I sometimes think as christians we do try to present our selves and our lives as perfect and sunny and as if we have over come life as we know it. It is so refreshing to hear the heart of a fellow Christian woman just being real. Life does have valleys and mountains. God is in control but we also have to work through navigating what’s around us. There is so much going on in this world. Amd yes little pumpkins can seem so insignificant when we see all the mess in this world. 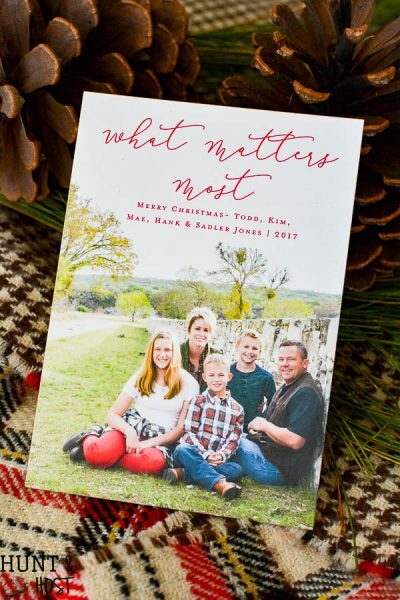 8 years ago I and my family made the decision to lay aside as much as possible of “traditional holiday stuff” and just clung to the simplicity of God and His word. Christmas even became just a rush to buy stuff and get the warm fuzziness. But in the end it did not produce those deep feelings of intimacy with God I longed for. I searched my heart, my feelingson, and then God’s word. Our whole family had been celebrating God’s biblical feasts days ever since. With all the focus of course on Jesus Christ as our cornerstone and salvation. We have never looked back. I would just like to encourage you today to keep pressing into God and yes, use this forum to connect with others, share with others, even cry with others. Life is a messy journey. If you’re feeling these feelings ask God what is He trying to reveal to you this time of year. Don’t be afraid to dig deeper. He will never disappoint. Have a blessed day. Loved this post. Yes, accepting Christ doesn’t = problems solved. I think that is the largest misconception about Christians. I hope that God will use me to shatter that image a little because heavens knows there is nothing perfect going on over here…redeemed yes, perfect no! I agree the holidays are way out of focus and have been for us as well. I work every year to pull back a little and focus more, desiring to raise my kids with the right frame of mind. I look forward to looking back on this quiet period and seeing what God’s plan was all along. Thank you for your thoughts and encouragement. I, too, am in this exact space right now. I find myself in a place I’ve never been before, and just yesterday, I acknowledged that God must want me here for a reason…..and, He’ll let me know what that reason is in His time. Waiting is the hard part! I’m not good at it…..or anything else for that matter. See, a few months back, my business partner decided he wanted to retire, so we closed our business….a job I had held for 18 years. It was my professional identity. Bear with me here, while I give you a couple of additional details so you’ll get the whole picture….my husband is a firefighter in a neighboring city (where we now live) which required him to travel about 40 minutes or so each way, as long as there were no traffic tie-ups with our tunnel systems. Traffic could increase his commute to an hour easily! He is also the bomb squad commander for the fire department bomb squad in that city. That position requires quite a bit of planning, training, and educating. So, between the two positions he has, he is on the go a lot. Since my job was ending, and I’d be job hunting anyway, he asked that we please move closer to his job. How could I deny him that since he’d been doing all the commuting so I wouldn’t have? So, we searched and searched and found a house. Of course, we were short on time because we needed to be able to close on the house before I no longer had a paycheck. Banks are funny about lending money to someone who has just lost their job. So, we bought our new house with the intent of renting our old house. In order to get it ready to rent, we needed to do some renovations. We hired a contractor (the work started July 1). Then my husband went and had a heart attack (only 5 days after starting the project). His 2nd in 2 years. I’ll spare you the details but believe me when I say, God spared us BOTH. Things turned out well, and he’s doing great! But, after that, we decided we didn’t want a rental property almost an hour away (because we moved about 15 minutes further into the city away from our old house), so the house went on the market. Before it hit the market, we spent every day of the summer, that my husband wasn’t working for the city, going and doing projects for the other house, plus I spent all of my days, while he was working, doing things there as well as overseeing the contractor. We got lucky, and it sold in 8 hours (that was August 25th….I also turned 50 that day). That was a relief, and a testament to all that we had done to it. It felt good! I continued to go back each week to take care of the lawn and make sure the house was ok). We closed on that house this past Monday. So….project complete and no tenant to deal with! We have a grown daughter who is a teacher in the city my husband works for and lives about 15 minutes from where we have now moved. Previously, with tunnel traffic, it could take her anywhere from 40 minutes to 2 hours to come see us….or us to her. And, that was just one way. As you can imagine, none of us made many impromptu trips. Knowing that I would be closer to my daughter also made the decision to move a little easier. It’s only been this past week that it has finally begun to pay off because we spent all summer working at the old house. Finally, I’m headed back to where I was going in the beginning…I promise! Now that my business has completely closed, and all the details that go with that have been taken care of, I have no job. But, I have a couple of ideas that I’m working on. However, I keep hitting road blocks. The process has been taking much longer than it should. It’s been so frustrating for several reasons, one of which is, I AM A PEOPLE PERSON. I LOVE to be around people. Having said that, remember my move about 50 minutes or so from my old house? Well, that also meant leaving all of my friends. Yes, I am still close enough that I can still see them from time-to-time, but it now requires more planning…you know, that tunnel I mentioned earlier? So, at 50 years of age, I’m having to figure out who I am. What is it that I like to do? Right now, I don’t know who I am or what I like. Well, obviously, I know some things but not enough to define me. I’m confused and frustrated because I don’t know. I have worked since I was 16. I don’t know who I am without a job. Unfortunately, I don’t have a degree, and the type of work I did is going by the wayside. So, here I am in a new neighborhood and no job to go to. I’m having to reinvent myself professionally and personally. My world has been spinning. Not to be able to get things moving for my businesses has left me wondering WHY. As I stated in the beginning, just yesterday, I told God that I’m finally understanding that He wants me to be still for now. However, I’m not good at being still. I told Him that I understand He has a plan, and it’s not time for me to know what that plan is. It’s hard for a person like me to sit and wait on things to fall into place. Being still has left me time to think. Maybe that’s the purpose of making me be still. I’ve been wondering, what is my purpose in life? I have no special talent or skills to share. My work wasn’t something that would impact another person or have a lasting effect on anyone. So, I’ve asked God many times lately, what is it that I’m here to do? I live in a new house, in a new area, with no job….I have a husband who has a job that requires a lot of his time, and a daughter that is busy living her own life (which is how it’s supposed to be). Cutting out his commute has been a blessing as is being able to see my daughter without having to create a major evacuation plan. But, at the end of the day, there’s still me. Who am I? And, what am I supposed to be doing with my life? I don’t know the answer to either of those questions, and because I don’t, I’m making sure that I consciously remind myself to take one day at a time. To not think too terribly much. But, get up each day, and find a reason for being, if only for that one day. I know it took a small book to get the story out, but I just wanted to give you enough information of where I’m at, and how I got here, so you would understand that you truly aren’t alone in how you feel. In fact, that’s exactly what I thought when I read your post today. I wasn’t as interested in the pumpkin as I was the message you wrapped into the DIY post. It shouted at me, “you aren’t alone in how you feel.” I can’t tell you how good that made me feel….not that you are in this place with me, but that I’m not alone. Does that make sense? I hope so. For a few years now, I’ve had this feeling off-and-on, but never come up with any answers. I hope this time is different, because when I get to feeling this way, it begins to work on my confidence. Then, I begin to wonder if I’m good enough, etc….you know how it goes. I want to know that my life has purpose, and that it’s bigger than I am. And, right now, I don’t know it. But, I do know that God loves me. He knows what’s in my heart. And, He had me read your post today. Thank you for sharing the “messy” part with us today. It truly made a difference in my day! I love this story, thank you for sharing. It is so fun to watch God’s hand at work in other’s lives and he clearly has been and is at work in yours! This story rings familiar to me…it is almost exactly why I started this blog. I too have worked since I was 17 years old and my husband and I sold the company we owned together. He went to a new job and I stayed home. What a blessing, but then I sat for the first time not knowing what to do with myself! Partnered with my 40th birthday I was a mess! God called me to this little slice of the internet and I have no doubt that he has a wonderful plan in store for you. In the meantime I hope you enjoy the extra time with your man and your daughter. Will you please keep me posted on how this story develops! Thank you for sharing and encouraging! Even i at 67 wonder about this world but i am a christian and know God has a purpose for me to stand for what is right and tell others about Jesus my savoir. This was a great post and we are just human sometimes. Have a great day. 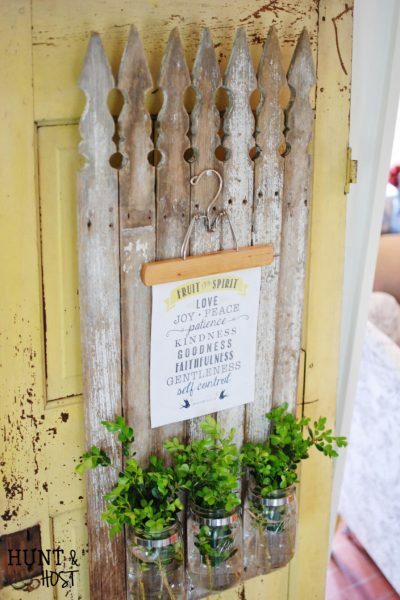 I have a little sign I made that I have in my studio to remind me when I want to complain, rail at the world and be a grumpy goblin mama….”Have an Attitude of Gratitude, Give Thanks, Be Giving.” It makes all the difference in the world. I hope it helps those here struggling. what a great sign and yes, gratitude always turns things around! Even Mother Teresa wondered at times if she was doing what Christ wanted her to do and if it really mattered. You are in good company there. I love your blog. At 62 I had to work through losing my professional identity. Feeling untethered, I used to lie in bed and in my heart I would say, “God, I’m still able and willing. Isn’t there something for me?” No lightening, thunder or rainbows appeared but I’m now 66 and have a sense of purpose, I care for my widowed father who has Alzheimer’s and homeschool my teenage grandson as well as run my household and love and honor my husband. I’m also active in church. This is a far cry from my 6 figure corporate job but it’s where God has put me for now. No, it didn’t fit at first but I am now comfortable and grateful and fulfilled with purpose in life. There is no retirement in God’s kingdom. The fields are white, the workers few. This is my place for now, I’m sure there will be new chapters in my future. I praise the Lord for your candidness. It is all too easy to listen the voices in our head asking ‘what is the point’. Truth of the matter is that without Christ, there is no point. As for having a direction, dear sister, you have one even when you cannot see it. Hebrews 12 tells us “let us also lay aside every weight, and sin which clings so closely, and let us run with endurance the race that is set before us, looking to Jesus, the founder and perfecter of our faith”. When I am discouraged and find myself listening to the lies of the god of this world I am comforted by reading Hebrews 12. Eyes to Christ, sister. It’s not about cute pumpkins, it’s about fulfilling the commission that you have been entrusted with. If making sweet little pumpkins gives you that opportunity then may your home be filled with them as they are evidence of the treasures laid up in heaven for you. Now, go put your shoes on…it’s time to run! Thank you so much, I honestly don’t feel like running. I want to but just can’t get there. I know you are 110% right, thank you for the encouragement! Every day I am pushing further and I see the light at the other end of this tunnel. 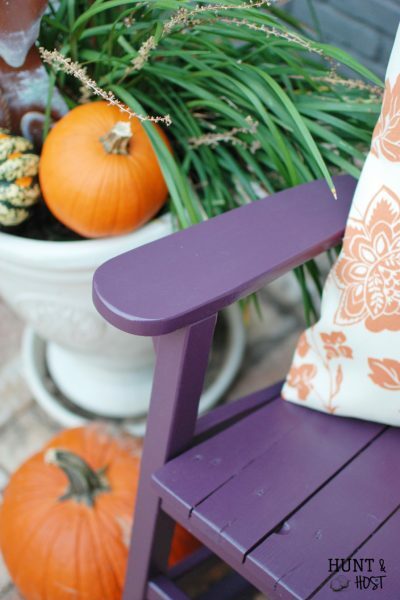 It does matter that your home is all cute and cozy for fall – Sometimes we just need to sit and be still and enjoy the beauty that surrounds us, let it feed and rejuvenate our soul. Lord knows there’s too much ugliness in the world right now. Your little space provides joy and inspiration for your readers and that’s a good thing. Thanks for writing from your heart. I love this! 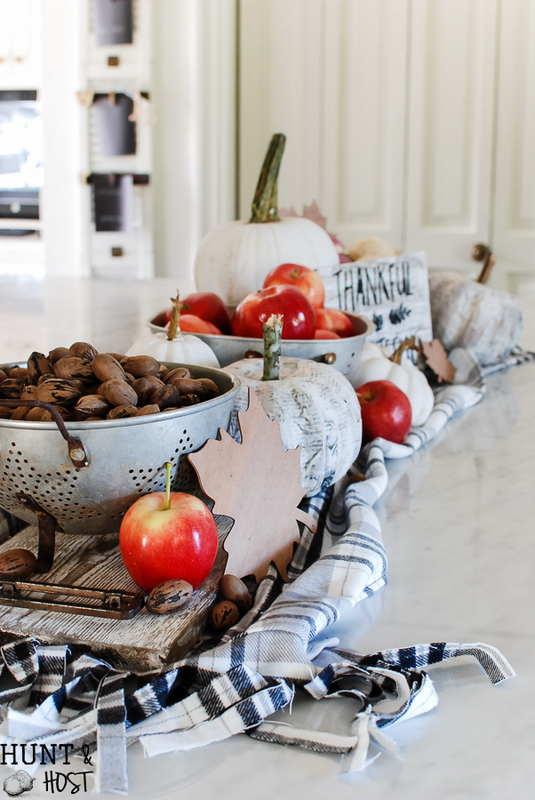 Such a different wat to bring some fall into your home! I am walking through a valley… I know the Lord will provide but gosh, it is dark here. Thank you for being a tool in the hand of our King. He has used you to remind me that even in the darkest places the Lord will light my path with the truth of his word. I wrote this a year ago and to read it again let me know how far I have come, I was in such a dark place the end of last year, beginning of this year and I feel so much better. I remember thinking I don’t see the light at the end and now I’m through it, hold on your light will come…it is there, even if it is hard to see. God is always there. thank you so much Gina. I love this story of your son and I know it matters, but sometimes it is hard to remember!!!! Blessings and thanks for your sweet words, they soothed my heart today. I think we all have periods of time like you are currently trudging. I always come out of them with greater faith and a sense of purpose again. I pray that you will too. As for the “little pumpkin thing” you offered today, it is exactly what I have been looking for. Today’s been a tough day for me and finding your post really put a smile on my face. I don’t think the best parts of life are the big accomplishments but rather an accumulation of steady, small things that lift my spirits when I take the time to slow down and notice them. I am praying that your needs will be met and that you find joy in your doings again whatever they are. And thank you for your blog. It often lifts my spirits. thank you for this. I agree…the small things add up and make such a difference if we take the time to see them. SO happy to be a light in your day. Also, that Scripture, “Fret not because of those who are evil… Psalm 37, helps when watching the news. And my favorite how to think Scripture: Philippians 4:4-13. Oh and remember God has prepared you in advance, Ephesians 2:10. Thanks for continuing daily to encourage us through tour blog and sharing your creative gifts. I love all these scriptures and appreciate you sharing them with me, so special 😉 and yes – need to tone down that orange!